After your Project is processed, a Subject List is available for download and includes all generated Project data—including URLs and passwords to send directly to your customers if you're not having them use your Studio Search Page, or using Paper Proofing. The Subject List can be used for your mailmerge using services like Mailchimp or Constant Contact. Need to export Project images too? Use the "Get Bundle" feature. 1. Select "Get Subject List" for your Project. 2. Select how you would like the filenames listed and then click "Get Subject List". 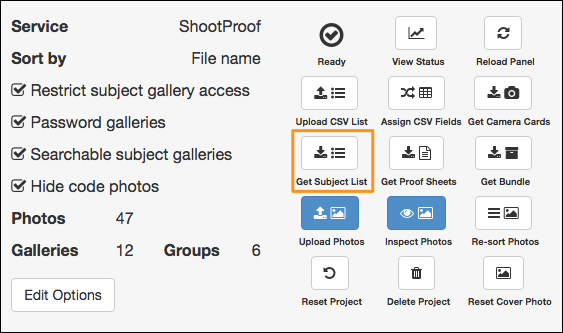 Include Photo Filenames: Lists all image filenames for each subject in one cell. Expand Filenames: Creates one row for each image filename. Subjects with no photos taken will have no values in the filename column making it easy to see who wasn't photographed. 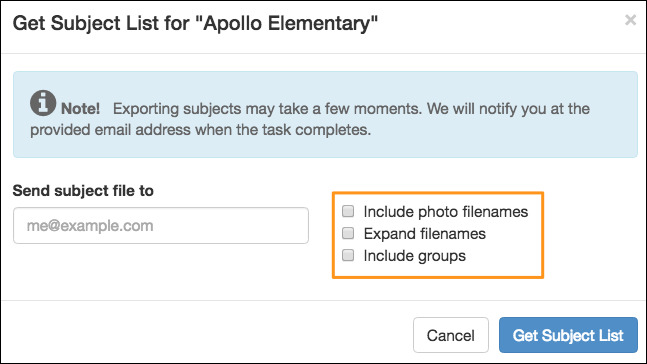 Include Groups: Check this box to include the group photo information to the end of the list.